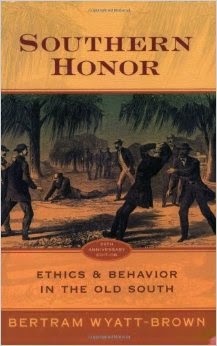 Book Cover: "Hailed in The Washington Post as 'a work of enormous imagination and enterprise' and in The New York Times as 'an important, original book,' Southern Honor revolutionized our understanding the antebellum South, revealing how Southern men adopted an ancient honor code that shaped their society from top to bottom. Using legal documents, court cases, letters, diaries, memoirs, and newspaper columns, Wyatt-Brown offers fascinating examples to illuminate the dynamics of Southern life throughout the antebellum period. He describes how Southern whites, living chiefly in small, rural, agrarian surroundings, in which everyone knew everyone else, established the local hierarchy of kinfolk and neighbors according to their individual and familial reputation. By claiming honor and dreading shame, they controlled their slaves, ruled their households, established the social rankings of themselves, kinfolk, and neighbors, and responded ferociously against perceived threats. Honor required men to demonstrate their prowess and engage in fierce defense of individual, family, community, and regional reputation by duel, physical encounter, or war. Any threat, whether from the slaves themselves or from outside agitation, had to be met forcefully. Featuring a new introduction by the author, this anniversary edition of a classic work offers readers a compelling view of Southern culture before the Civil War." Taryn's Review: Now that I live in the South, my move and work have brought up a lot of historical questions for me. As I learn more about the region's history, the nagging questions of "Why?" entered my mind often. Why were men so violent? Why did the communities partake in violence against people? Why were some people ostracized and not others? Even reading about a man like Jackson, who participated in duels and executed his own men, raised questions for me as to how he was accepted by the community and even the nation after such misdeeds. Under what circumstances could bad behavior become negated when overruled by the community-at-large? Bertram Wyatt-Brown answered my questions and he answered them well. When I first began the book, it was a bit theoretical and technical. However, once Wyatt-Brown delved into the sources, his thesis became much clearer. While this book was written by an academic for academics, I think it is one that a history lover could appreciate as well. The rich variety of primary sources that Wyatt-Brown included make this book incredibly readable and memorable. I definitely have a better understanding of the social mores and culture that pervaded antebellum Southern mindset. The book also demonstrated how incredibly violent and menacing life in the antebellum years could be. I chuckled to myself when I think of the people who long for "the good old days" of yesteryear; after reading this book, one should be grateful that we've evolved in social and justice matters. Definitely a fantastic read for anyone interested in Southern history. The book comes in big at 500 pages, but trust me, once you start getting into the meat of the book, it will quickly become an entertaining read.